Remotely Light 3 foot balloons! 4...... L.E.D. Balloon Lights that have 10 multi-color L.E.D.s on each light disk. The lights have a loop on the back for hanging in a large balloon. 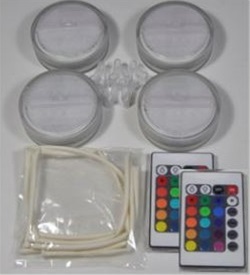 The kit comes with clips and 4-160's latex balloons to get you started....The kit DOES NOT include the AAA batteries for the lights. 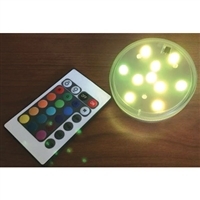 Each light disk requires 3 AAA batteries and weighs 3 ounces with the batteries.